Bluegreen Travel Services Amenity Departure! Get $60 onboard credit* when you book any stateroom on the 2019 sailing of this Greenland cruise with Bluegreen Travel Services. Remote, vibrant and rich, Greenland is unlike anywhere else in the world. Discover Norse ruins, Inuit cultural traditions and historic colonial buildings nestled among dramatic fjords and colossal mountains on this extended sailing that takes you from the stunning natural beauty of the Canadian Maritime Provinces to the more populated southwest coastline of this massive island. Greenland’s northerly position, largely above the Arctic Circle, results in natural phenomena such as summer’s midnight sun and winter’s Northern Lights. Exciting adventures await you aboard the Caribbean Princess, from staterooms that offer a more restful sleep to endless tempting new dining options and fresh experiences for kids and teens. Halifax, Nova Scotia: Stroll through the beautiful Victorian-style public gardens in Canada’s “City of Trees.” Learn the city’s role in the Titanic disaster at the Maritime Museum of the Atlantic or one of the local cemeteries where the lost were buried. Or take a scenic drive along the coast to Peggy’s Cove, a charming fishing community with a much-photographed lighthouse/post office. Sydney, Nova Scotia: You shouldn’t be surprised to hear a bagpipe in this city on Cape Breton Island where Scottish immigrants settled. The Port of Sydney is home to the World’s Largest Fiddle, which plays a medley of songs composed by a local musician. Take an excursion to Baddeck and the Alexander Graham Bell Museum, where you can learn about the inventor of the telephone, or discover the area’s mining history on a tour of a real coal mine at the Cape Breton Miners’ Museum. Nuuk, Greenland: Greenland’s capital and largest city is home to a population of 16,000 and displays a magnificent vista of mountains and valleys. Shore excursions are not available here, but the town is easy to explore on your own. Stroll the streets and talk to the locals, or purchase an Inuit handicraft. Explore the culture and history of the island at the Greenland National Museum, or visit the quaint 18th-century church, Vor Fresler Krike (Our Savior Church). Qaqortoq, Greenland: If you’re a seasoned traveler with a taste for destinations untrammeled by modern tourism, this is the ultimate port of call. Qaqortoq means “White Palace” in Greenlandic, and this small town of about 3,400 is the cultural and commercial center of Southern Greenland. Explore the ruins of a stone church dating back to the Viking period, or take a factory tour at Great Greenland, known for producing fine quality animal skins and coats. Shore excursions are not available in this port. Nanortalik, Greenland: Nanortalik means “place of bears” in Greenlandic. Summer visitors to this extraordinarily isolated port may spot polar bears on the offshore flow ice. The waters also teem with seals and Minke, humpback and fin whales. Dramatic boulders dot the landscape and are well known to the world’s elite rock climbers. Visit the Nanortalik Open Air Museum, which features original colonial buildings, Norse ruins and items of Inuit culture. Shore excursions are not available in this port. St. John’s, Newfoundland: The oldest city in North America is a busy fishing port with a good natural harbor bounded by hills. Its history and cultural spirit show strong Irish and Scottish influences evident in its pubs and music. Check out Signal Hill, the site where the first transatlantic wireless transmission was received in 1901, or head to Bird Islands, a refuge for marine birds like bald eagles, kittiwakes and Atlantic puffins. 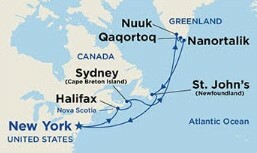 Call 855.645.2215 to Book Your Greenland & Canada Cruise Today! *BLUEGREEN TRAVEL SERVICES AMENITY DEPARTURE ONBOARD CREDIT OFFER TERMS & CONDITIONS: $60 onboard credit per stateroom booked through Bluegreen Travel Services. Onboard credit may be used for select purchases aboard the cruise ship and has no cash value. New bookings only. Subject to availability. Terms and conditions apply. **TRAVELER PLUS POINTS-FOR-CRUISES BENEFIT TERMS & CONDITIONS: In order to apply any combination of annual, biennial, borrowed or rented Bluegreen Vacations Points for payment, cruise fare, including base fare and taxes, must be a minimum of $500 per person for the first and second passengers in a cabin, for a total minimum fare of $1,000. Benefit applies only to active Traveler Plus members. Please note that price is listed per person, non-air, cruise-only and based on double occupancy. Subject to change without notice. Princess reserves the right to impose a fuel supplement of up to $9 per person per day on all passengers if the NYMEX oil price exceeds $70 per barrel, even if the fare has already been paid in full. Prices are subject to change based on availability. Stateroom views are considered unobstructed unless noted otherwise. Obstructions do not include certain nautical items like handrails, dividers or ship hardware. For balcony staterooms, the view is determined from the perspective of the balcony railing. Prices shown in USD. Please review complete Terms & Conditions, including Cancellation Policy. Ships of Bermudan and British Registry. Great Vacation Destinations, Inc., doing business as Bluegreen Travel Services, is located at 4960 Conference Way North Suite 100, Boca Raton, FL 33431. Great Vacation Destinations is an Iowa Seller of Travel No. 688, Washington Seller of Travel, Florida Airlines Reporting Corporation (ARC) registration No. 15-72225-4, California Seller of travel registration No. 2068362 (Registration as a Seller of Travel does not constitute approval by the State of California). Void where prohibited by law and where registration and/or licensing requirements have not been met. In the event of a conflict between the Princess Cruises’ Details of Participation and Great Vacation Destinations’ Details of Participation, Princess Cruises’ Details of Participation shall govern.